Tender stalks of asparagus at the store are a sign that Spring is upon us (or at least we hope it is). This recipe for Asparagus Tapenade has been in my stack of ‘must try’ recipes for a long time. I wish I could remember where the recipe came from so I could give proper credit. Asparagus Tapenade is a great recipe for anyone, but is a tasty treat for those practicing a Vegan or Vegetarian diet. I served the Tapenade with vegetables and bits of bread. It was great with both but I LOVED it on artisan bread. Bring pan of water to boil over high heat. Rinse and trim ends from asparagus, then cut in 1 – 2 inch pieces. Add asparagus to water, return water to boil, reduce heat to medium. Cook until just soft and still bright green, about three minutes. Drain well. Meanwhile, toast pine nuts in a dry skillet over medium high, stirring occasionally, watching carefully to avoid burning. Add remaining ingredients to a food processor. Add toasted pine nuts and cooked asparagus. Pulse until thoroughly blended but still roughly chopped. Transfer to clean container and refrigerate until fully chilled. Serve with crackers, vegetables and/or on crostini/bread. What is spring without fresh asparagus? Asparagus and fresh lemon and a drizzle of good olive oil and, voila, you have lemon asparagus! Thinly slice the lemon. Arrange in one flat layer on a baking sheet. Toss the asparagus with the olive oil until evenly coated. Arrange asparagus over the lemon slices. Sprinkle with salt. Broil for approx 6 minutes (in our oven) or until asparagus spears get a few browned and crispy areas. My first recollection of asparagus was slimy canned asparagus served with school lunches. Yuck! My Mother would occasionally gather wild asparagus in the spring, but it was not a regular visitor to our home dinner table. As an adult, I’ve learned to love asparagus and the many ways it can be prepared. I ran across this recipe AND I had all of the ingredients. This recipe is so simple and quite elegant. Tonight I paired it with salmon, always a wonderful combination. Next time I try this recipe, I may use chopped pecans for a little different twist. Break off or trim the woody ends from the asparagus and discard. Set the spears aside. Heat the olive oil in a skillet over medium heat. Stir in the pine nuts, cranberries, and salt. Cook and stir until the pine nuts start to look translucent, 5 to 6 minutes. Add the asparagus spears to the skillet and cook, adding a little more olive oil if needed, until stalks are bright green and tender, about 5 to 8 minutes. Serve on a platter and top with the cranberries and pine nut mixture. Spring is just around the corner and while I really don’t care about swimsuit season, I do care about looking and feeling better and looking ‘fabulous’ for daughter Sarah’s summer wedding. While I love to indulge in wonderful foods, I find that a healthy, Mediterranean style diet works well for me. I tried this recipe and loved it. Fresh asparagus and goat cheese with protein…a winner! Each omelette only has 180 calories, an extra bonus. 1. Whisk together egg substitute, eggs, and milk. Stir in the scallions, thyme, parsley, pepper and salt. 2. Place the asparagus in a microwaveable bowl and add water. Cover with waxed paper and microwave on high for 2 minutes. Stir. Microwave 2 additional minutes. Drain and pat dry. 3. Heat a medium nonstick skillet coated with cooking spray over medium heat. Pour one-quarter of the egg mixture into the skillet, allowing it to cover the bottom of the pan. Cook for 2-3 minutes or until the bottom just begins to set. Sprinkle with 1 tablespoon goat cheese and one-quarter of the asparagus. Cook for 5 minutes, or until the eggs are almost set. 4. Using a large spatula, fold the omelet in half. 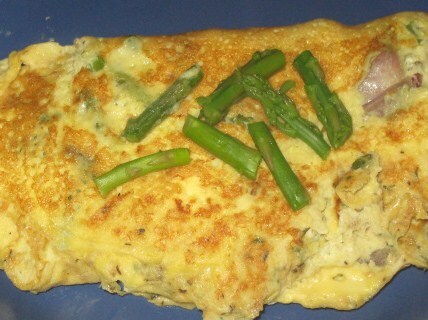 Cook for 2-3 minutes or until the omelet is golden and the cheese is melted. Turn onto a plate and keep warm. 5. Coat the skillet with cooking spray and repeat for 3 additional omelettes. Garnish with chives, pieces of asparagus or goat cheese. 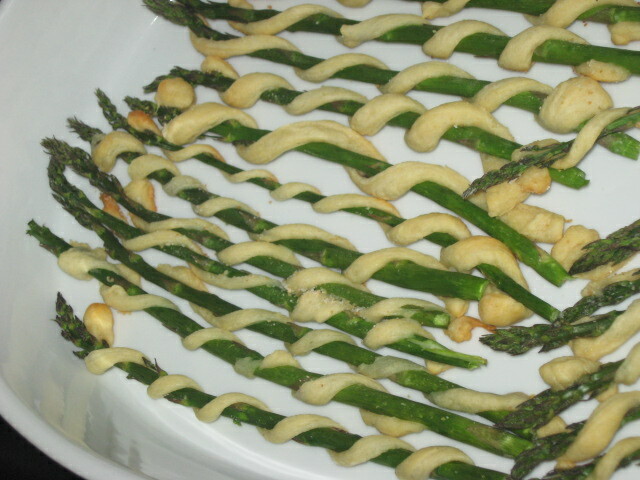 Fancy Schmancy Asparagus…simple crowd pleaser! A dear friend introduced me to this dish a few years ago. The asparagus is elegant enough for a nice dinner party yet casual enough for an appetizer or family side dish. People will ‘ooh and aah’ at the presentation and keep coming back for more. We are coming into fresh asparagus season and a perfect time to try this recipe. This dish is best served fresh from the oven. Enjoy this favorite dish enjoyed by family and friends. Heat oven to 375 degrees. Grease large baking sheet. Wash and trim fresh asparagus and dry on paper towels. Open crescent rolls and separate dough into four squares. On a cutting board, cut dough into strips of about 1/8-1/4″. Wrap one strip of dough around each piece of asparagus and place on baking sheet. Sprinkle lightly with garlic salt. Bake for 8 to 10 minutes until dough is light brown.